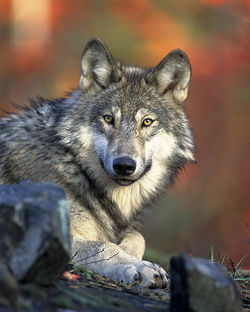 Gray Wolf is the common name for the wolf species known by the scientific name Canis lupus. 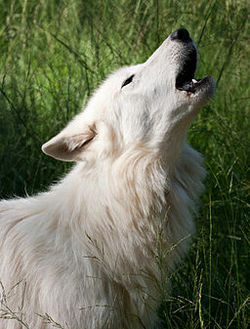 Also known as the Timber Wolf, it is the largest canine and is the species from which the domestic dog was bred. They inhabit most of North America, Europe and Asia. Though the gray wolf often appears in folklore and fairy tales as the antagonist, many scientists believe they may be the answer to wiping out some incurable animal diseases and an unprovoked fatal wolf attack has never been recorded in America. The gray wolf inhabits many places; from deserts to tundra, grasslands, forests, mountains, and are often spotted in housing areas that have been built over their old homes. Animal Diversity Web Julia Smith and Tanya Dewey, 2002. This page was last modified on 29 March 2018, at 15:52.